← PICTURES: Okorocha donates Land, N2m to BBNAIJA2018 winner. Less than a year to the end of his tenure, Imo State Governor, Rochas Okorocha has disclosed that his administration will launch an empowerment programme tagged “My People, My People Empowerment Programme” as a parting gift to Imo people. Okorocha added that the essence of the programme was to reduce poverty in the State to its barest minimum. The governor made this known on Monday, May 21, 2018 while on inspection of some on-going Projects in Owerri and environs, stressing that in 2011 when he became governor, the poverty level in the state was 57%, but by 2017, the poverty level in the State has come down to 19%, courtesy of his administration. He also explained that the My People, My People Empowerment Programme would further reduce the poverty level to 5%, recalling that he had promised the people of the State that once the flight gets to a cruising level, that the captain will come out and merry with everyone. “This time around, we are going to remember the very poor people, poverty level is low in the State but we want to reduce it to the barest minimum. Traders and people who are trying to survive with goods less than 10,000 naira in their shops, forms will be brought out very soon and all that are interested for the empowerment will fill.”. He further stated, “I will personally supervise the empowerment exercise which will be termed, my people, my people, empowerment. This will help some of our street traders to start a better life and we are targeting 50,000 people across the three zones of the state. This exercise will start between now and September. This will be my parting gift to Imo people”. 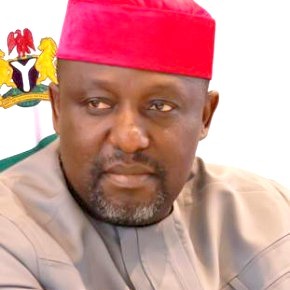 4 Responses to "Okorocha set to launch “My People, My People Empowerment Programme”"
Has the governor closed his mind and maintained a heartless posture on the pensioners? God is watching him.